This blog is a repost of the original article written by Carlie Porterfield of the Hays Free Press. Click here to read the original article. A small, vacant lot in Plum Creek was the site of a Monday groundbreaking that could be the first step in empowering thousands of entrepreneurs in impoverished countries. Through a nonprofit called Homes for Hope, local builder Bigelow Homes will build a house, sell it, and donate the profits to Hope International, Homes for Hope’s sister organization that provides loans and support for economically disadvantaged people in foreign countries to grow their own businesses. “This is a groundbreaking event for a groundbreaking strategy of helping people,” Homes for Hope Executive Director Jack Nulty said. Unlike Habitat for Humanity, or other groups that build homes for the purpose of donating it, builders and vendors donate time, money and materials to build a home to later be sold on the market. Homes for Hope then connects those funds with Hope International, which will distribute loans on the ground. Nulty said the profits from a house like the one being built in the 1000 block of Nevarez in Kyle, could help as many as 4,000 families all over the world. 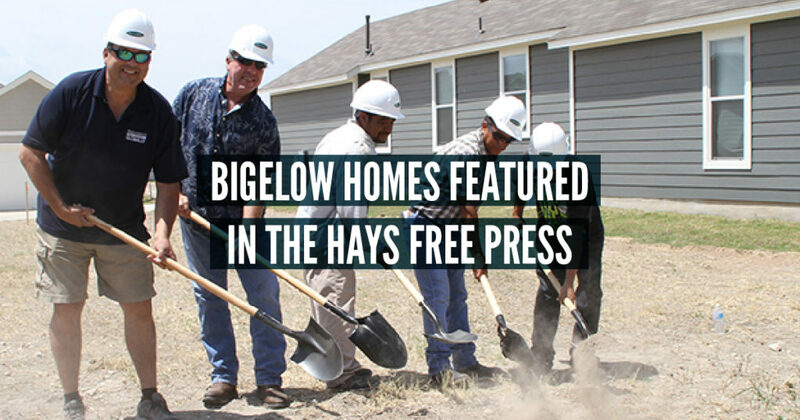 It will be the second home Bigelow Homes will have constructed for Homes for Hope in the area. Nationally, the company has built eight homes and raised nearly $2 million with Homes for Hope. Hope International operates in 16 countries all over the world and issues loans as small as $40 or $50 a person to everyone in a group of entrepreneurs, who agree to cover each other’s losses and hold each other accountable when the loan is to be paid back in six months. Despite collecting no collateral, the group says about 98 percent of clients pay back their loan and interest, which is usually set at about 18 percent, Nulty said. Eighty-three percent of people who recieve loans are women, and are often mothers, he said.